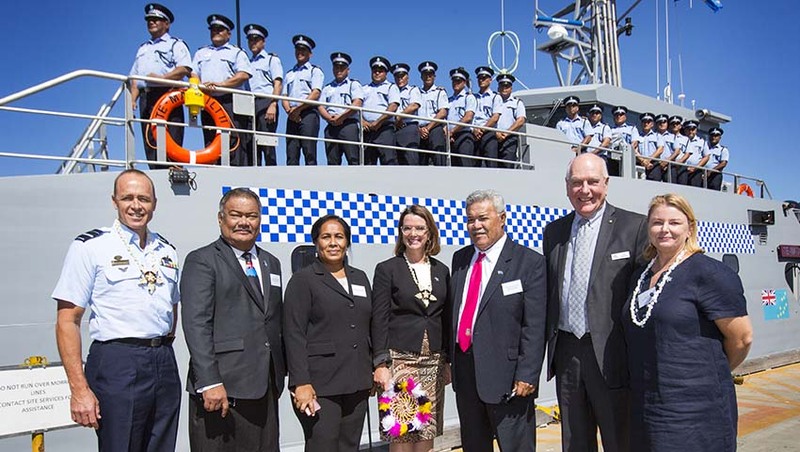 As part of the Pacific Maritime Security Program’s Pacific Patrol Boat Replacement project, the Australian government has gifted a Guardian Class patrol boat, the Te Mataili II, to the government of Tuvalu. The vessel was gifted at a handover ceremony in Western Australia, and was received by the Prime Minister of Tuvalu, Enele Sosene Sopoaga. The ceremony was attended by the Tuvalu Minister for Foreign Affairs, Trade, Tourism, Environment and Labour, Taukelina Finikaso, the Minister for Natural Resources, Dr Puakena Boreham, and Commissioner Luka Falefou of the Tuvalu Police Service. Minister for Defence Christopher Pyne said he second patrol boat to be gifted under the Pacific Maritime Security Program’s Pacific Patrol Boat Replacement project was an important part of regional security. Austal said it is "pleased to deliver this program for the Commonwealth of Australia", after the on-time arrival of the patrol boat. "The Guardian Class has brought together the industry-leading skills of over 200 Austal employees, and is estimated to have employed an additional 200 people indirectly through the design, construction and sustainment process, which will continue through the life of the program out to 2023, ” Austal CEO David Singleton said. Minister for Defence Industry Linda Reynolds noted that the gifting of this vessel marked the start of a busy delivery period. “The project is one component of the government’s $2 billion 30-year commitment to the Pacific region under the Pacific Maritime Security Program.”. Papua New Guinea was the recipient of the first Guardian Class patrol boat in November 2018. “This is Austal’s first major defence shipbuilding program using a steel hull. It is a reflection of the skills, experience and management of the Austal team that since May 2016 we have developed a brand new facility in Naval Base, WA, designed a production line assembly process, completed the detailed vessel design and are now delivering the second vessel less than three years later,” Singleton said.